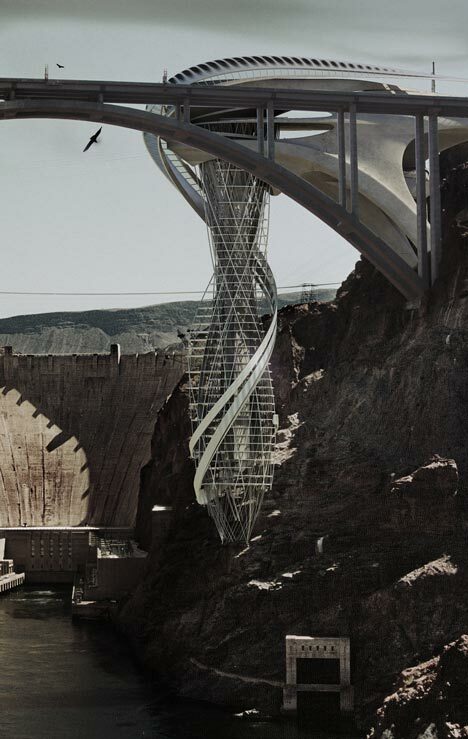 Architecture graduate Stephan Sobl has designed an upside-down skyscraper to hang over the Colorado River in Nevada, right beside the Hoover Dam. 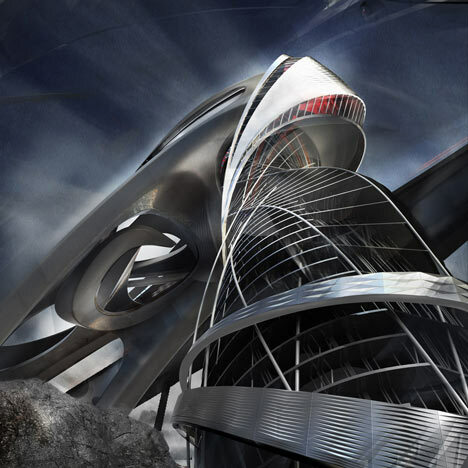 Entitled Vertical Strip, the conceptual tower would provide a casino, a hotel, a boxing ring and a concert hall, like the nearby Las Vegas Strip. 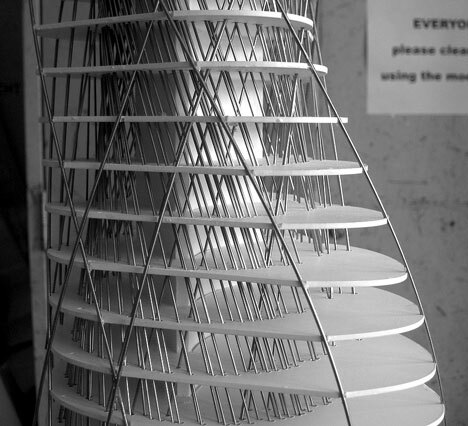 The lightweight carbon-fibre structure would be suspended from a concrete cantilever and supported by a spiralling metal shell. 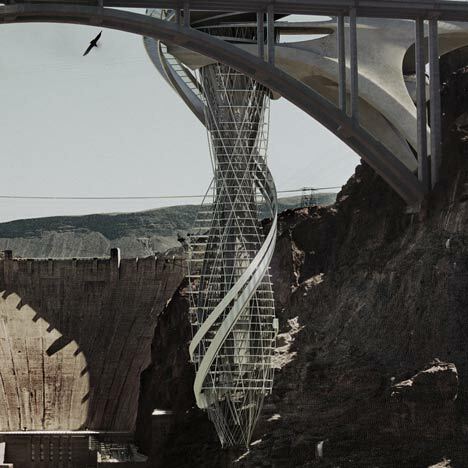 Located between the dam and the bypass bridge, the tower would be accessible to both cars and pedestrians from the adjoining road. 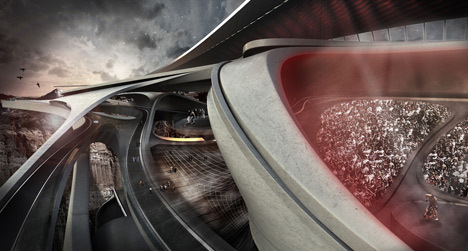 Sobl developed the project whilst studying at the University of Applied Arts in Vienna. The following information is provided by the designer. My Diploma is about the interplay of opaque massive surfaces capable of incorporating poché and lightweight, fragile structure. 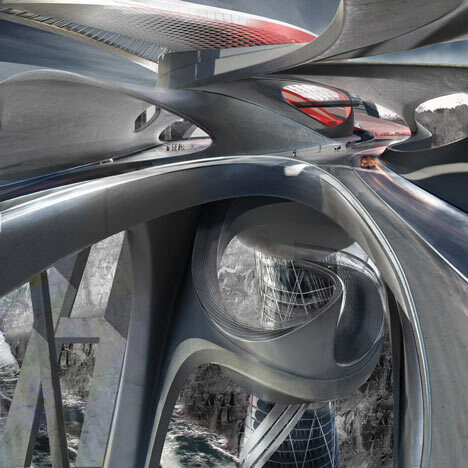 The resulting environments developed by these distinct architectural languages are exploited and distributed vertically to create extreme spatial sequences. 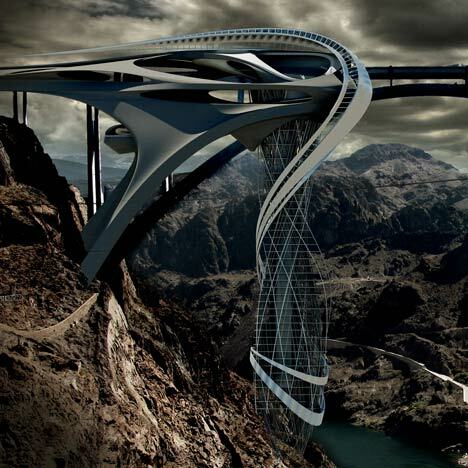 The project is a casino resort, a satellite alternative to Las Vegas, located on a dramatic site between the Hoover Dam and the Bypass Bridge. The resort caters to various 21st century vices including entertainment (concert venues, MMA Fighting), gambling and luxury living. The architectural challenges I dealt with were taking the convential vertical tower, including its plynth and orientation, and turning it upside down. Architectural elements: The massing layout is construed by the event space on top with a framed view of the Hoover Dam; the casino underneath leading to the hotel lobby and the hotel itself. At the bottom of the tower there is a dramatic area for happenings and ceremonial occasions. It also includes a breakfast room and high end dining with the elevator core floating above the space; a glass floor providing views to the ground; and terraced floor slabs. breathtaking diagonal views of the hanging tower with a constant interplay of plunging and emerging.